A time-lapse of one of the aerogels flexing from a held-closed position back to its original straight shape. Photo by Sam O’Keefe/Missouri S&T. 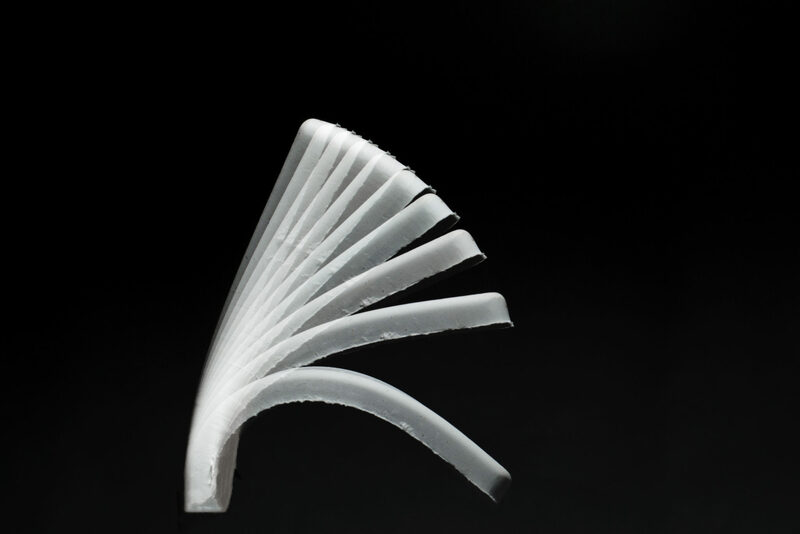 Polymeric aerogels are nanoporous structures that combine some of the most desirable characteristics of materials, such as flexibility and mechanical strength. It is nearly impossible to improve on a substance considered the final frontier in lightweight materials. But chemists from Missouri University of Science and Technology have done just that by making aerogels that have rubber-like elasticity and can “remember” their original shapes. Aerogels are created by replacing liquids with gases in a silica, metal oxide or polymer gel. They are used in a wide variety of products, from insulation of offshore oil pipelines to NASA space missions. “The specific kind of polyurethane aerogels we have created are superelastic, meaning that they can be bent in any direction or be smashed flat and still return to their original shape,” says Dr. Nicholas Leventis, lead researcher on the project and Curators’ Distinguished Professor of chemistry at Missouri S&T. “Our superelastic aerogels are different from rubber in that they can on-command return to a specific form. That is, they also show a strong shape memory effect, meaning that they can be deformed and cooled and keep the deformed shape forever. Leventis and his group have demonstrated this unique property by shaping a “bionic hand” that is capable of mimicking coordinated muscle functions. When stimulated by heat, the aerogel and can close from its open-palm state and grab a pen. Missouri S&T researchers created this “bionic hand” to demonstrate the biomimetic properties of new polymeric aerogel materials. Leventis and his team’s work can be seen in the Chemistry of Materials journal published today, Tuesday, May 2, by the American Chemical Society. Working with Leventis at S&T are Dr. Chariklia Sotiriou-Leventis, professor of chemistry, and graduate students Suraj Donthula, Chandana Mandal, and Adnan Malik Saeed, and summer interns Theodora Leventis and James Schisler. The work was supported by the U.S. Army Research Office, and partial support was also provided by BASF Polyurethanes GmbH.